With the June 30, 2009 vote by the Federal Drug Administration advisory committee to eliminate prescription acetaminophen-combination painkillers, Fibromyalgia patients have to be concerned. Concerns of abuse, addiction, and even cases of death, led to their recommendation to ban prescription painkillers like vicodin and percocet. The committee also voted to lower the maximum dose of over-the-counter painkillers with acetaminophen, like Tylenol and Excedrin, due to a rise in cases of liver damage. According to the FDA, acetaminophen remains the leading cause of liver failure in the U.S. It is too soon to know what, if any, impact this will actually have. The FDA is not required to follow the committee’s recommendation, although historically they do. At the very least it is a good time to consider what options you have to prepare for the possible ban. Prescription painkillers will always be available in some form. With complaints of chronic pain on an epidemic rise, drug companies will see to it. But prescription painkillers need not be the only option for Fibromyalgia pain treatment. So what can I do to ease my pain naturally? I am glad you asked! In the midst of a severe Fibromyalgia flare-up, there may be nothing as quick to bring relief as good old – insert your painkiller of choice here, but for daily maintenance and preventative health care, natural is best. Your food should be your first medicine. In a previous post I listed the many toxic foods to avoid if you have Fibromyalgia. Now lets take a look at foods and herbs beneficial for pain management. Essential fatty acids are a must. EFAs like Omega-3s are necessary fats that humans cannot synthesize, and must be obtained through diet. Omega-3s have a natural anti-inflammatory quality along with a whole complex of other health benefits. Research indicates that omega-3s may be better absorbed from food than supplements. Wild salmon is a great source of Omega-3s, as are other fatty fish like albacore tuna, halibut, and sardines. Not a fan of fish? Flaxseed oil and Canola oil are good choices too. Or how about walnuts? Try a sprinkle of walnuts on spinach salad for a nutritious and delicious double dose of essential fatty acids. Summer squash, cauliflower, and broccolli are all very good sources as well. Herbal remedies also aid in pain relief. Natural pain relief — like herbal medicine, is an increasingly popular way to manage pain. Turmeric is gaining great recognition as a natural painkiller. Why not try sprinkling some on that piece of salmon you are grilling up? Fresh ginger helps with inflammation. Capsaicin applied topically may be beneficial for relieving pain. Feverfew has been found useful for treating migraines. Ginseng is listed by the American Pain Foundation as beneficial for Fibromyalgia pain treatment. If you are serious about trying herbal remedies for pain relief, I advise that you consult with your physician or a licensed herbalist who understands how powerful these herbs can be. More and more research indicates that Fibromyalgia patients suffer from magnesium deficiency. Magnesium is extremely important to many functions in the body, and a deficiency can cause several of the symptoms associated with Fibromyalgia. 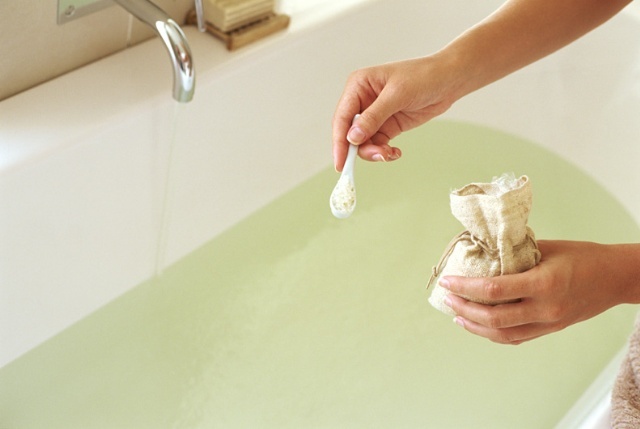 There are great benefits in taking an Epsom salt bath, rich in hydrated magnesium sulfate, which is easily absorbed through the skin. Relieves stress. Excess adrenaline and stress are believed to drain magnesium, a natural stress reliever, from the body. Magnesium is necessary for the body to bind adequate amounts of serotonin, a mood-elevating chemical within the brain that creates a feeling of well being and relaxation. Improves formation of joint proteins, brain tissue and mucin proteins. Prevents or eases migraine headaches. I don’t think we could ask much more from a simple bath! Epsom salt baths are so relaxing and therapeutic, I recommend you take two or three a week – more if your level of pain dictates. Before bed is a great time, as you will find yourself so relaxed by the natural serotonin boost, you will be able to gently drift off into a restorative sleep. Yoga, Qigong, meditation and many other mind-body practices teach the healing properties of purposeful breathing. Conscious breathing can actually change your body chemistry by increasing oxygen supply to your cells and prompting the production of endorphins, which are the body’s natural pain killers. Deep breathing relaxes the muscles and calms the mind. 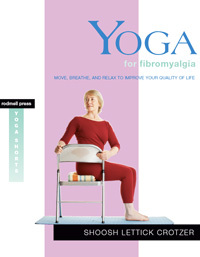 In her book Yoga for Fibromyalgia, Shoosh Lettick Crotzer teaches The Healing Breath technique. To practice this, begin in a seated pose with your feet flat on the floor and your arms resting lightly on your thighs. Close your eyes, follow the directions below, and let your breath heal. Inhale and exhale slowly, focusing on how the air feels as it passes through your nose, into your body, and back out. Think of your breath as the gift of life – prana: life force. Let it feel soothing as it flows inside. If you have general pain, visualize this healing breath filling your whole body. If your pain is more specific, on inhalations, bring the breath directly to your pain. Then, for either type of pain, let each new inhalation bring energy to expand and soften, cleanse and release, rejuvenate. With the exhalations, let the tensions and heaviness of your pain flow out with the breath. Breathe slowly, and continue until you feel quiet, heavy, and more relaxed. Come out of the pose when you are ready. Notice the difference you have made in yourself. Mindful breathing will bring you more in-tune with your body. It is something we should all practice everyday, regardless of our level of pain. Self care is critical in the management of Fibromyalgia. There is no magic pill that will reverse all of the symptoms we live with. There never will be. So instead of waiting for the magic bullet, we should focus on simple and manageable things we can do to help improve our health and wellbeing. It may take a great combination of holistic and natural remedies, combined with the care of our doctors, to really achieve optimal results. Be your own best health advocate and practice the Healing Breath technique, cook yourself some salmon for dinner, and then take a relaxing epsom salt bath. You are worth the effort. Excellent Info. I’m allergic to the combo narcotics, so I won’t feel the affects of a possible ban: I can’t imagine all of the other fibro sufferers who are able to gain a moments relief, having to hurt constantly, like I do. The alternative info you provided in this post is priceless. I love your blog so much! Thanks for sharing your knowledge and helping all of us who struggle with fibro. I just started taking Vicodin for a back injury and saved a stash of it realizing that I could have been using it for intense pain all this time but was so afraid of it (one of my best friends became very addicted). Heading to the epsom salts now…thank you for the reminder. I used to keep a list of everything I could do to relieve the pain when the pills weren’t helping but it got lost somewhere in the move. I needed that list because when I’m in the middle of a flare I just can’t think. Thank you for saving me the time and effort to recreate my list…I like your list better! What a helpful post!Thank you!I will try your suggestions and keep you posted for the results!I really need some relief! Yes, you are very right. I have FMS and I haven’t been able to get it under control for about a year now. My doctor told me that I am in no condition to work. But, I don’t really see any other options as I am a single mother. I have tried lots of pharmaceutical medications to get the pain under control and they have caused other health problems. I am currently looking into finding a homeopathic doctor to possibly help me out. Beth, I don’t have RA, but do have OA of the knees and am putting off getting knee replacement. I also have degenerative discs as well as spinal stenosis so I empathize with you in many respects. To make a long story short, my ortho doc had me get a recumbant bike (which we found used–cheaper than paying for PT) to work on my knees. It happens to have the least impact on the body. I have found it useful for my fibro and it doesn’t hurt my discs. When it hurts my stenosis, I just slow it down. It is something you might consider. Hey, thanks for the fantastic post- I will try some of these! Keep up the good work. I am a man suffering from Fybromyalgia. I will say that epson slat baths work great for me. I also have found an all natural patch that works very well. It’s made by a company called Naturopatch Of Vermont. I use the Arnica patch to treat direct pain. It works wonders. Anyone taking Lyrica should investigate new medications for Fybromyalgia. Lyrica was great in the beginning. In the end, Lyrica about made me lose my mind, family and job. With the weight gain and irritability it was just unbearable. I am now trying the drug Savella. So far so good. I have lost weight and feel like I am getting back to the old me. I have also had great luck with Essential Oils and Aromatherapy. Would love to hear any other suggestions on dealing with pain. Hello my name is Kay read your blog on your approach to fiber pan. Read my blog on Fibro Haven. Please research Savella it has bad side effects sound worse than Lyrica. Try Acupuncture and cupping and if possible Dead Sea Salts from the Nile in a bath or Jacuzzi. Also ask your doctor for a Tens Unit the items mention help. I am going to locate your pain patches to see if they work better than the ones I use. I ordered DermaMeg that stated it would elevate pain but I have not yet used anything Holistic that alleviates pain for more than four hours. I buy Valerian extract in bulk but yup must drink 2Tablespoons x4 hrs to get relief. if you need more info let me kays328@gmail.com. I’ve had Fibromyalgia for 7 years 18/18 tender points along with severe back pain, chronic full body pain daily. The barometric pressure, humidity and cold environment exasperates the pain. I have tried all mentioned in this article. Epsom Salt does not work for me but Dead Sea Salts that can be purchased (5 pound bucket) from a locale health food store or on-line will relieve a little of the pain along with Tai Chi, Acupuncture, Cupping, Swimming, and Yoga when I can tolerate it. The natural approach to my pain is with Krill, B Complex, COQ10, Multi Vitamins, Pearl Jasmine Green Tea, medicated Ti’anhe plaster patches provides a little penetrating pain relief (I use one on my lower back the other on my hip /arm) located in China Town were I receive Acupuncture, Valerian Extract/Tea (good for temp pain relief) located at local health food store. I have ordered Derma Meg will begin Ayurveda Therapy next week. I am still looking for a pain relief method, I have been on many drugs NSAIDS and OTC etc. ongoing struggle. EBRT Treatment gave me temporary euphoric experience this treatment originated from Australia-expensive. I appreciate anyone in the health care community who research methods for pain relief for Fibromyalgia but if one has not lived and walked in the shoes of Fibromyalgia or Chronic Pain suffering individuals it’s impossible to advise treatment. I’ve been diagnosed with fibro chrnic fatigue and Epstein Barr for 7 years plus. The best pain reliever has been b12 shots WEEKLY, tumeric supplement , Metafobiolic, horse chest supplement and vitamin D3. I double or triple dose on the vitamins/supplements. I take 25plus pills a day. Cymbalta 60mg 2x daily also has worked great for fibromyalgia. Massage and Epsom salts are great. Last resort ice packs. Blessings to all. I feel your pain. Makes me cry. Oh did try arthritis bc powder today flare up stopped . amazing. Have been so pleased to find this helpful website, after suffering with M.E. (Myalgic Encephalomyelitis) and Fibromyalgia for years and years. Have tried most things, but drugs are a No.No – with such side effects, always preferring more natural means. I am thoroughly disabled through years of pain and torture! I am going to try the Magnesium Malate, if I can get it in liquid form, as I also have swallowing difficulties, and many other add-ons. Years ago, I was told I was borderline on Magnesium deficiency, so am sure I am deficient now. I am taking Vitamin B.12 in drop form, and also Vit.C and Calcium and Vita.D plus Milk Thistle drops for liver, and also a digestive enzyme before meals. Just coming out of one of the worst flares I’ve ever known. Its useless going to a G.P. as all they want to put you on are more drugs and stronger pain-killers, which make one so very ill. I would add that I do believe apple cider vinegar is helpful, only 2 teaspoonfuls in water, or fruit juice, with honey. Thank you for this good website, a real help. My question is…what if I am already doing this? Diet and breathing exercises, yoga, ginger tea, etc. (Honestly, I haven’t soaked in epsom baths…) But seriously, what are the ppl to do that do or have done all this and more, but continue to have moderate to severe pain EVERYDAY!? Are you looking for holistic/drug free options Melissa? First, not a single one of these suggestions are magic bullets. They are all just suggestions to help ease your pain. It takes a combination of these and more for me to experience relief, and it takes continuous, consistent practice – and I still have pain. I chose not to use any prescription meds. Sometimes I take ibuprophen. I take magnesium every day. I often use my heating pad. I allow myself to rest when my pain is at a level I cannot manage. I pray, I meditate, I watch funny movies. Valerian is recommend by many for pain. Today might be a good day for me to try this for the first time. My pain is very high today, so I will do what I can to manage it holistically. I find the thing that helps me the most is remembering it is only temporary. Pain is fluid – it ebbs and flows, it moves, it is not constant. Today is a high pain day. I hope for a better day tomorrow – for both of us. would love to have a group like yurs in my area. i live in western north carolina just west of asheville called bryson city. would love to have a group like yours in my area. i live in western North Carolina just west of asheville called Bryson City. I was diagnosed with fibro about a year ago. Since then my pain has gone from mild to severe. I work 40 hrs a week and its all I can manage , I am always tired. I cant stand for more than 2 hrs, I cant sit for more than 2 hrs. I take lyrice and codeine.At first this helped but now I find no relief. My doctor just says I have to manage but at its most severe times I wonder how I can go on like this. I’ve been crying without knowing I am till somebody points it out. It is effecting my kids, my job, and my quality of life is deteriorating day to day. I wish I could file for social security but I dont know how to prove just how bad it hurts. I would love to know if there is a chat room for people like us with FMS. I’d like to be in touch with those who suffer this illness. I also agree Epsom Salts work great! I do at times use scented salts such as Lavender. That way I can use aromatherapy and the salts at the same time. I also use Pure Essential Oil of Eucalyptus. It comes in a easy to use 1.7 oz. (50ml) spray bottle. Imported from Australia, 90-85% Cineole content. Arbor Oil’s double distilling process allows our eucalyptus oil to have superior qualities for a variety of uses. Arbor oil is 100% eucalyptus and is the purest oil available. It comes from Eucalyptus E-Polybractea or Blue Mallee and is proven far more effective than any other eucalyptus oil. This product has not been evaluated by the FDA. This product is not intended to diagnose, treat, cure or prevent any disease. Arbor Oil is 100% organic. http://www.arborproducts.com Its expensive so I try to use Biofreeze as well and use this when I really need it. My mother in law has fibromyalgia and she has came to live with us. I am doing research to learn what kinds of thing that I can do to help manage her pain. She has gotten to a point where she cannot handle these things on her own and I am really worried about the level of meds that her doc has her on. I don’t know for sure but I am afraid he is over medicating her. She has anxiety pills, muscle relaxers, and then he told her to manage her pain she needed to take B.C. powders and gave her a prescription for acid reducers b/c they will coat the lining of her stomach so the B.C.s won’t eat a hole in her stomach lining! Thank God we got her to a different doctor b/c I think the one she had was a fruit-loop. Any advice will be appreciated. Hi Amanda. First I would like to thank you for the care and interest you are showing in you mother-in-law’s health. What a blessing that she has you. I can offer you advice and my opinion, but I must caution that it is only that. I am not a medical expert, and do not begin to believe I know what they know. I can only share with you from my experience, and from what I have seen in the many people in my FibroHaven community. The meds do not cure or even improve the symptoms of FM. At best, they make them tolerable. But most often, they cause more symptoms and issues to deal with, and it becomes an unending cycle of “take this to deal with that” symptom. In my opinion – less is more. And the more holistic and alternative approaches she incorporates into her wellbeing management, the better. I also suffer from fibromyalgia and in my experience pilates and yoga help me immensely. I am not one to “enjoy” exercise but I have found that the first 10 minutes or so of a good stretching routine are more painful than helpful but by the end of the workout I feel much better. There are some wonderful dvd’s and from my experience they HELP! I currently participate in two Pilates classes each week and I’ve come to really look forward to it. Give it a try but be patient because the results aren’t immediate and in the beginning it might not feel like it’s helping. Commit to one month and see how you feel.